Red River Radio | Your source for great music and in-depth news. Airs Thursday, April 18, 2019, at 11 a.m. Bill Beckett spoke with director Richard Folmer about Shreveport Little Theatre’s new production of “The Fantasticks,” a musical by Harvey Schmidt and Tom Jones, directed here by Richard Folmer and choreographed by Ginger Folmer with musical direction by Robert Young. For complete details visit online Shreveport Little Theater or call 318-424-4439 . Airs Monday, April 22, 2019, at 1 p.m. Join us for another concert from the Grand Teton Music Festival with music director Donald Runnicles leading an all American featuring violinist Nicola Benedetti in the Violin concerto by Korngold and music from the film Schindler’s List by Williams. In between we'll hear guest conductor Jerry Hou in Invisible Mosaic III by Kernis. John Martin / This work is in the public domain in its country of origin and other countries and areas where the copyright term is the author's life plus 100 years or less. Airs Wednesday, April 24th, 2019, at 1 p.m. Violinist Itzhak Perlman and Klezmer Conservatory Band founder Hankus Netsky join WCRB's James David Jacobs to share music and memories of Passover from diverse traditions. Airs Thursday, April 18, 2019, at 1 p.m. The new season of concerts from the Santa Fe Chamber Music Festival continues as host Kerry Frumkin welcomes pianist Jon Kimura Parker, violinist Jennifer Frautschi, and cellist Mark Kosower for a performance of Beethoven's Piano Trio in C Minor, Op. 1, No. 3. Then the Orion String Quartet will be joined by violinists Martin Beaver & Owen Dalby, violist Ida Kavafian, and bassist Mark Tatum for the String Octet by Maz Bruch. Twenty years ago, a pair of students killed a teacher and a dozen of their classmates a high school in Littleton, Colo. The shooters at Columbine High School used semiautomatic weapons and sawed-off shotguns in the attack before turning the guns on themselves. Just a few months before that shooting, the FBI launched the National Instant Background Check System to try and prevent dangerous individuals from purchasing guns. 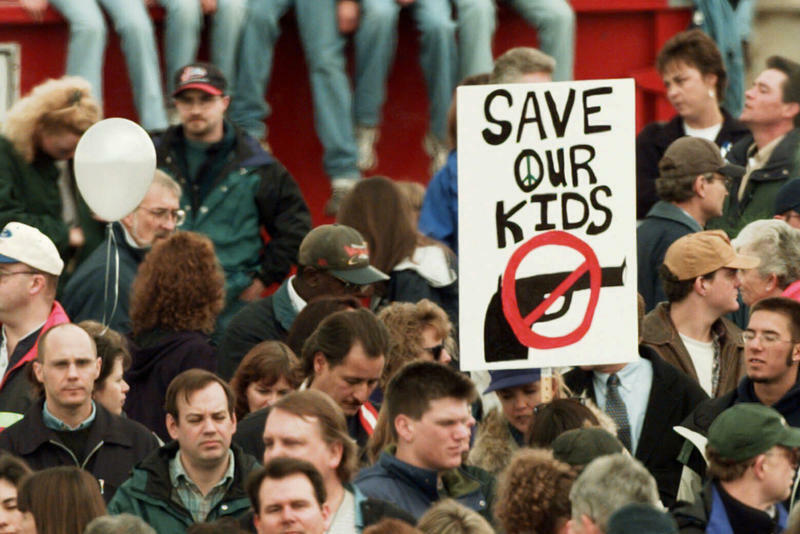 Tomorrow marks 20 years since two gunmen at Columbine High School in Colorado killed 13 people. The incident is still relevant today. This week, the FBI says a woman infatuated with Columbine made credible threats, traveled to the area and bought a gun. From member station KUNC, Leigh Paterson reports that, for the last two decades, schools have taken steps to better protect and care for their students. Gary Borders: Wendy Reves, From Marshall to the South of France. A small town girl with big dreams. Airs Friday, April 19, 2019, at 7:45 a.m. This week commentator Gary Borders takes us through the life of Wendy Reves, a child of Marshall with big dreams, dreams she made come true. Unknown / This work is in the public domain in its country of origin and other countries and areas where the copyright term is the author's life plus 70 years or less. Bodenfreund / This image or file is a work of a United States Department of Agriculture employee, taken or made as part of that person's official duties. As a work of the U.S. federal government, the image is in the public domain. RaphaelQS / This file is licensed under the Creative Commons Attribution-Share Alike 4.0 International license. Treasures Of The Noel: Plato's Republic. Airs Friday, April 19, 2019, at 4:30 p.m. This week on Treasures Of The Noel with Dr. Alexander Mikaberidze looks ancient Greece and Plato's Republic. The Vehicle Donation Program provides Vehicle Donation Services to Public Radio stations across the country. This is a great way to support this station and get a tax write off for your car. Contact the Vehicle Donation program directly online or if you have any questions about the vehicle donation process, please don't hesitate to reach out to our vehicle experts at 855-277-2346.